As you may have noticed, I have a serious thing for eating flowers. I really like the flavors of certain edible flowers, like lavender and rose. Today I tried a hibiscus drink and it was goooood. That’s going to have to wait until I can get some dried hibiscus online, though. Which I will do. Just wait. You may have also noticed that I really like making ice cream lately. Even without an ice cream maker (though I really, REALLY want one, have I mentioned that? Yes I have), I’m happily mixing up custardy concoctions. So when a totally random craving for rose water hit the other day (I’m weird, I know! Who else craves rose water of all things??) I decided to make an ice cream out of it. It wasn't meant to be THAT pink, but I was using liquid food coloring and it doesn't take "too much!" for an answer. 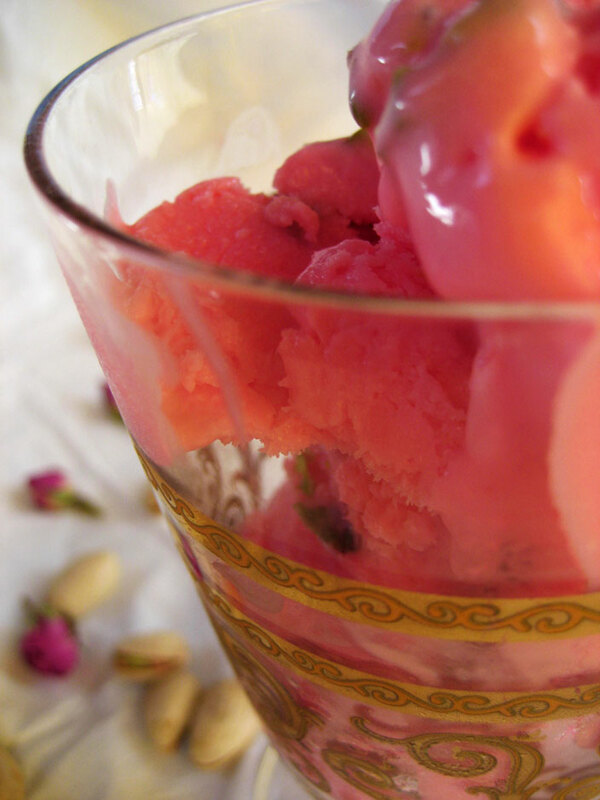 I was also in the middle of making my own yogurt, so for a fun twist on what would certainly be a very fancy ice cream, I decided to make a rose water frozen yogurt. Plus, according to my new favorite book, cream goes well with roses, but yogurt goes REALLY well. This totally hit the spot after getting home from walking around in the sunshine for a few hours. I think the reason that yogurt allegedly goes a bit better with roses than cream does is because of its tangy flavor. 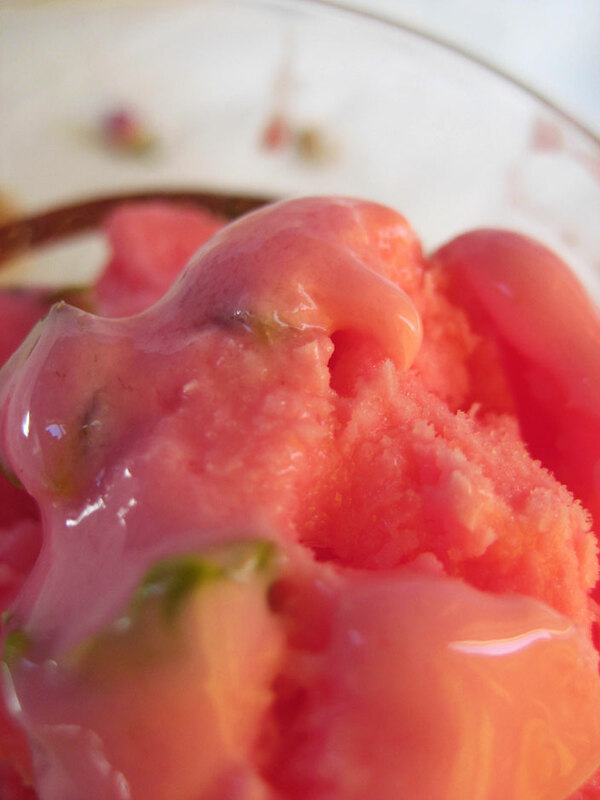 Cream smoothens flowery flavors, but the yogurt kind of stops the borderline over-sweetness of the rose flavor in its tracks with a nice cultured tang. More melty yogurtness. So good. Early on in the creation of this recipe I decided I wanted to use pistachios for an extra punch of contrasting color. They work perfectly in the yogurt, giving you a little extra something to chew on while providing a slightly more savory element. In short, yumsters! I don't know why I like to throw elements of my foods all over the place when I take pictures. 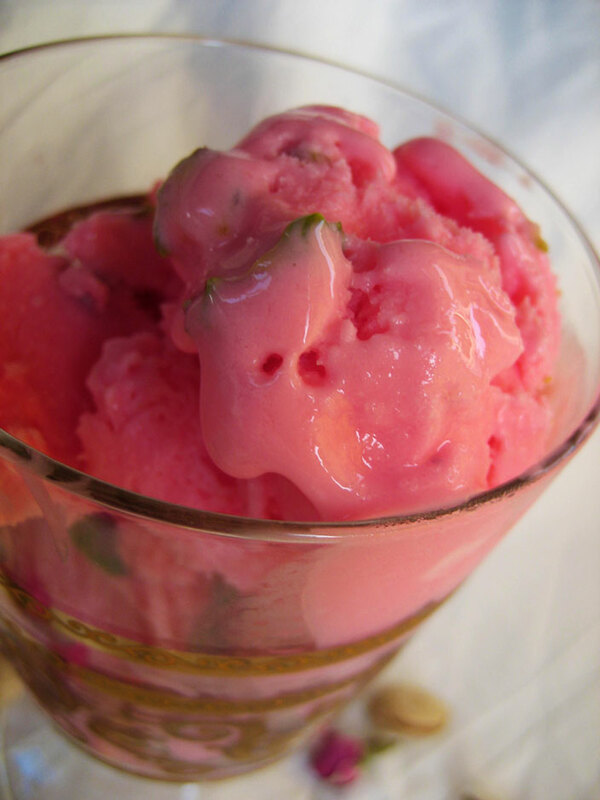 Combine the yogurt, sugar, rose water, vodka and food coloring in a medium-large freezer-safe container (or just throw it all in your ice cream maker, you fancy person, you). Stir to combine well. Stir in the pistachios, seal the container and freeze. Stir it up every hour or so until it is evenly frozen. If it freezes too hard, allow it to thaw on the counter 5-10 minutes (based on kitchen temperature) until it is soft enough to scoop. I really love this frozen yogurt. While I’d still love to make a rose ice cream, I think this was a very fun and worthwhile use of my first batch of homemade yogurt. Frozen yogurt shouldn’t be villainized as some kind of “lite” ice cream – it’s an awesome dessert that can stand on its own. You just need to treat it correctly. if you’ve filled yourself to the gills with rich ice-cream desserts, i have the perfect, light frozen treat that’s NOT sorbet — ie. it’s more than ice! i found this awhile ago online and can’t remember from where. it’s fantastic. whisk 1 egg white by hand for 2 minutes, then beat in 1/2 cup of sugar in a stand or with a hand-mixer. add in 1-2 cups of chopped berries (i used strawberries the first time, but anything would work) and beat on high for exactly 15 minutes. be patient — it’s SO worth it. transfer it to a freezer-safe container, and freeze it for 4 hours until it’s solid. it will have the consistency between ice cream and frozen whipped cream — it’s FANTASTIC. =) i’m sure you could add rose to it. Amazing! Not clear for me, how offen you updating your verysmallanna.com. And if you’re looking for hibiscus, I found some dried hibiscus flowers at Trader Joes last week. Can’t wait to see what you come up with those! 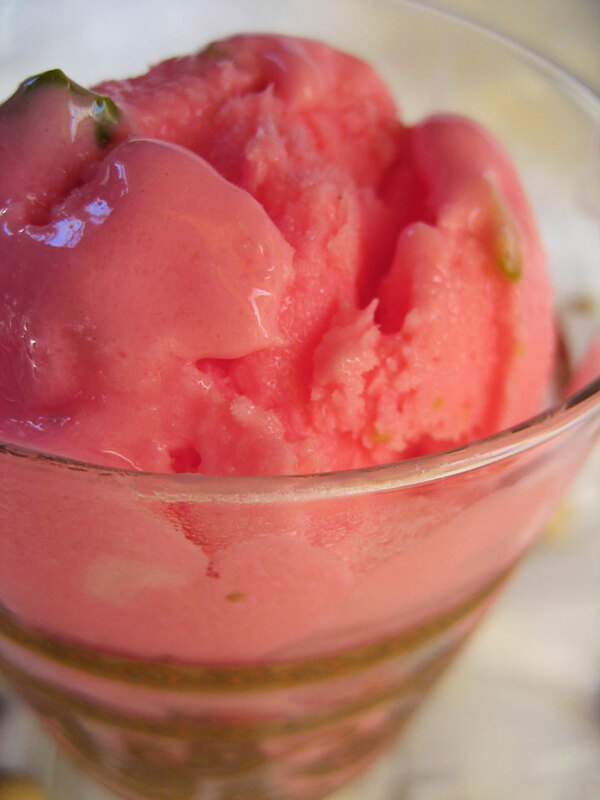 “Cream smoothens flowery flavors, but the yogurt kind of stops the borderline over-sweetness of the rose flavor in its tracks with a nice cultured tang.” — Sounds perfect! I just made froyo yesterday- mint chocolate chip. It was my first time making frozen yogurt, but definitely not my last! (I also dont have an ice cream maker) This recipe looks really interesting, I would love to give it a try. Thanks for sharing!